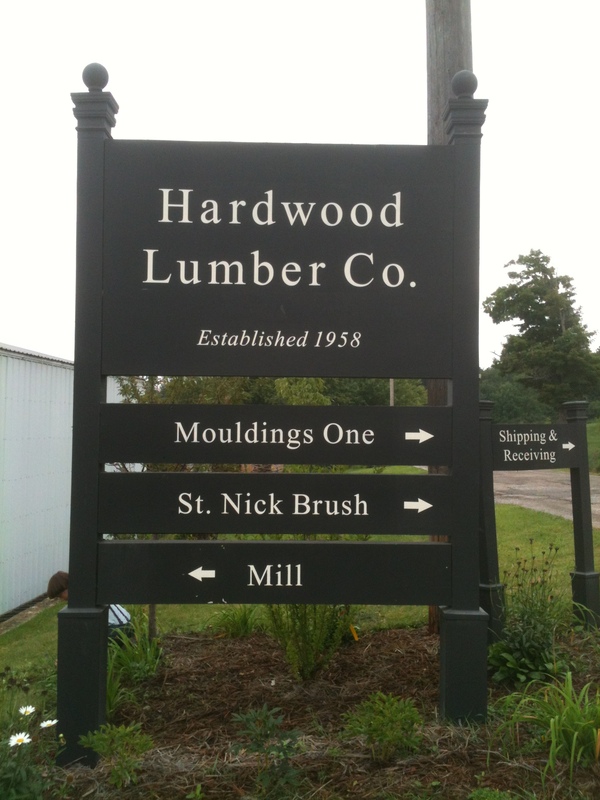 Hardwood Lumber Company is a great place to order butcher block counter tops. They ship products all across the country, but we’ve ordered twice from them and picked up the counters at their mill both times. 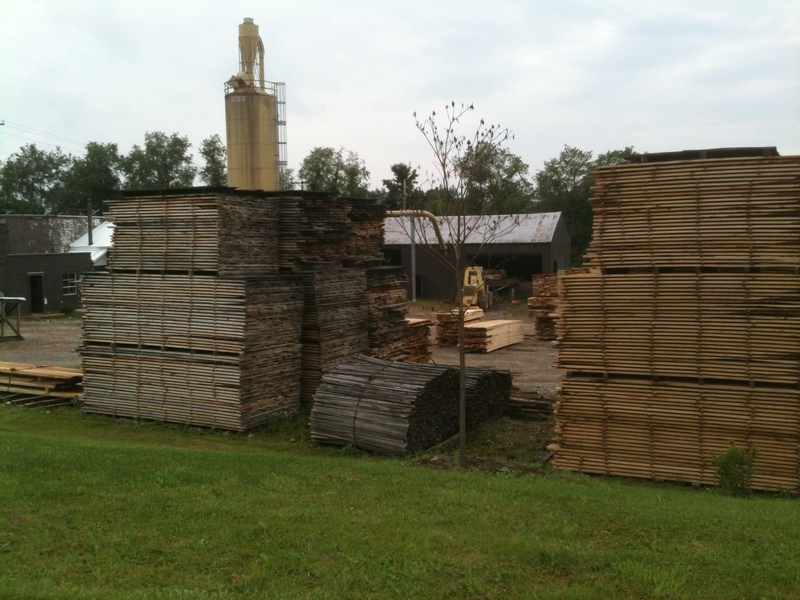 Located in either Burton, Ohio or Springfield, Ohio, depending whether you’re using their mailing address or a GPS, the company is in Ohio Amish country. Burton is a charming little Ohio town, but the GPS didn’t like that address at all. It’s very unnerving to put in what one KNOWS is the correct address and the Garmin responds with Address Not Found… After consulting two maps and an IPhone, the navigator (that would be me) decided to try Springfield, as it was the next town over. Thank goodness, the GPS found that one. This is the unmistakeable sign (after we finally found the correct road). In the same complex is a shop filled with every style of moulding imaginable, and an Amish broom company, as well as the mill. We had ordered two countertops made from Sapele wood, which is not a local wood, so I’m sure that our wood is not pictured here. Sapele is a sustainable substitute for mahogany — grown in Africa — and it is a rich dark brown after finishing. I talked to the secretary in the office several times — the sapele wood was a bit difficult to get and the order was delayed a couple of weeks. It didn’t matter to us at all, and they were so nice about it. They even offered to ship the counters for free if they weren’t ready by when we arrived. 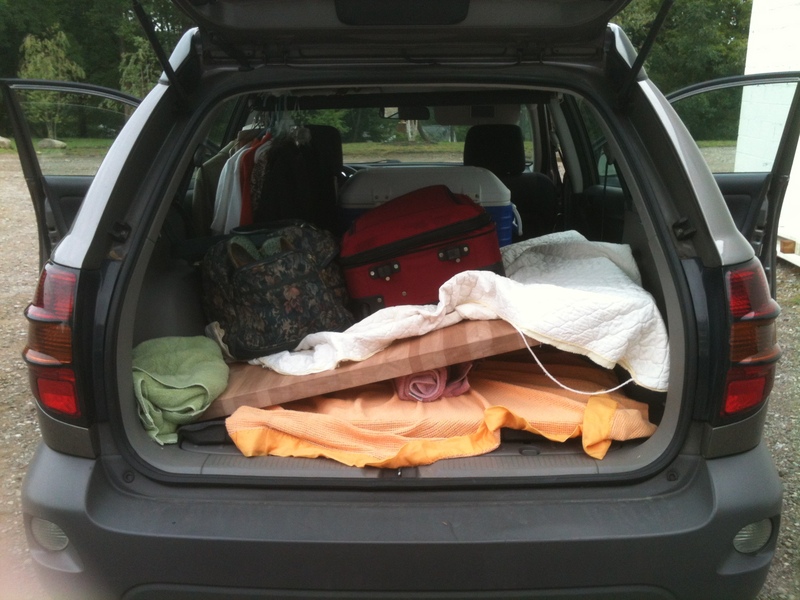 We were coming home from a visit with son, Casey, in Wisconsin, so we had to unload the car of all our suitcases and travel gear before we could load up the countertops. A young Amish man brought them out on a dolly and patiently waited for us to put our suitcases and cooler all over the parking lot. 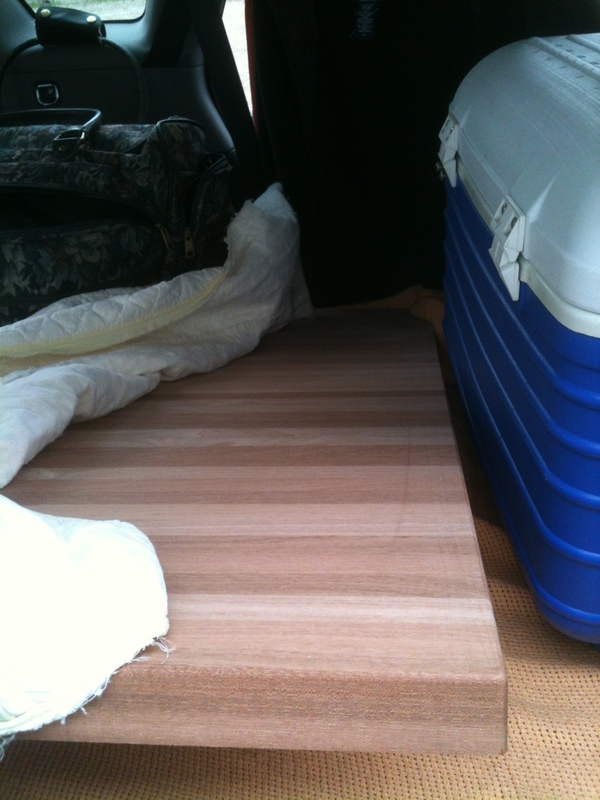 He and Michael loaded the countertops into the car, we signed the receipt, put back our suitcases, and we were off. It was quick and efficient, after the secretary finally located the paperwork, that is. I wasn’t worried; a nice man had called me the day before to tell me they were ready and to make sure we were picking them up. …and we’re loaded up and ready to head home. Greeting me this weekend? A dead mouse lying in the middle of the living room floor! Readers, you will all be grateful to know that I did NOT take a picture of it. It didn’t smell very good and a fly buzzed around lazily. It’s a good thing my shovel had a long handle… But even dead mice can’t quell the enthusiasm that comes from a beautiful new piece of wood. 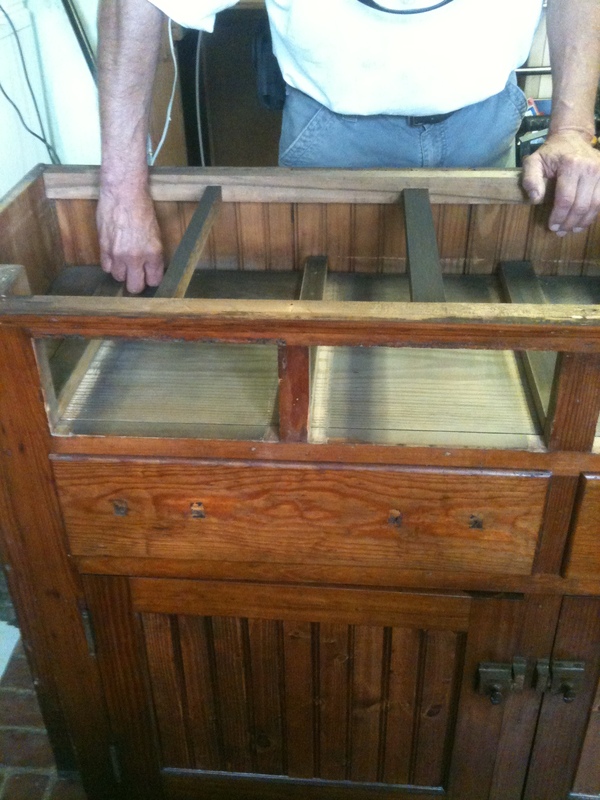 It smelled like a woodshop in the kitchen as we took off the old piece of wood and put on the new. 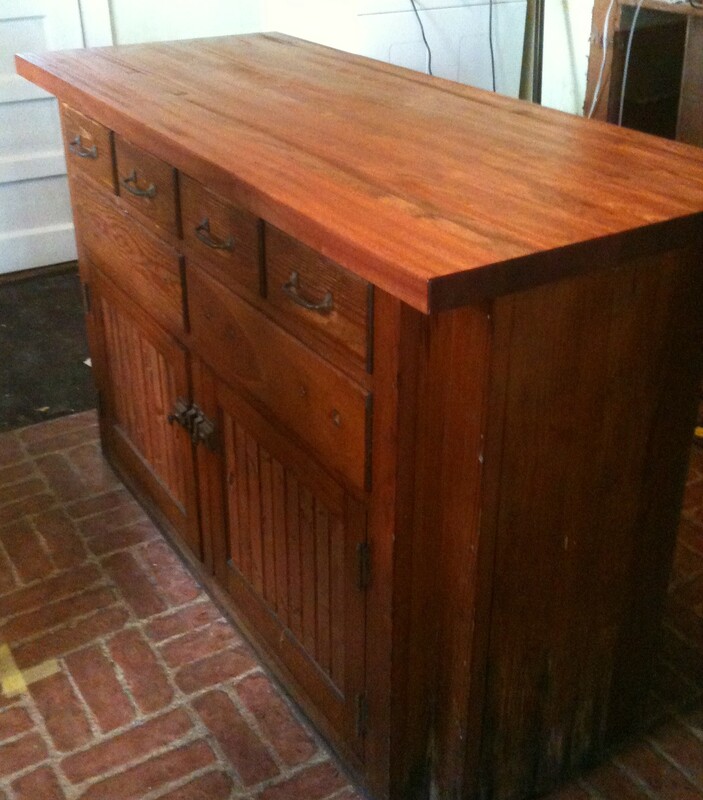 The next two pictures show the difference mineral oil makes on a butcher block countertop! to this wonderful rich color! 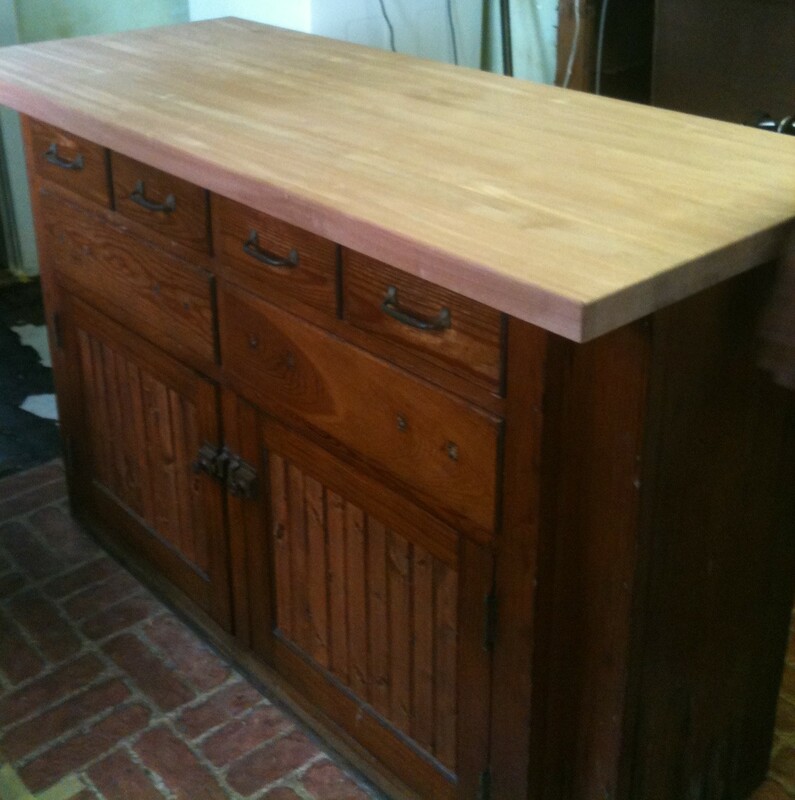 This luxuriously rich-looking butcher block top is in our kitchen right in the middle of a construction zone! I felt the need to cover it with a sheet the next day; it IS an island — in the center of the kitchen — and everything from paint brushes to utility knives to glasses filled with iced tea will do their damage… We did cook on it though. 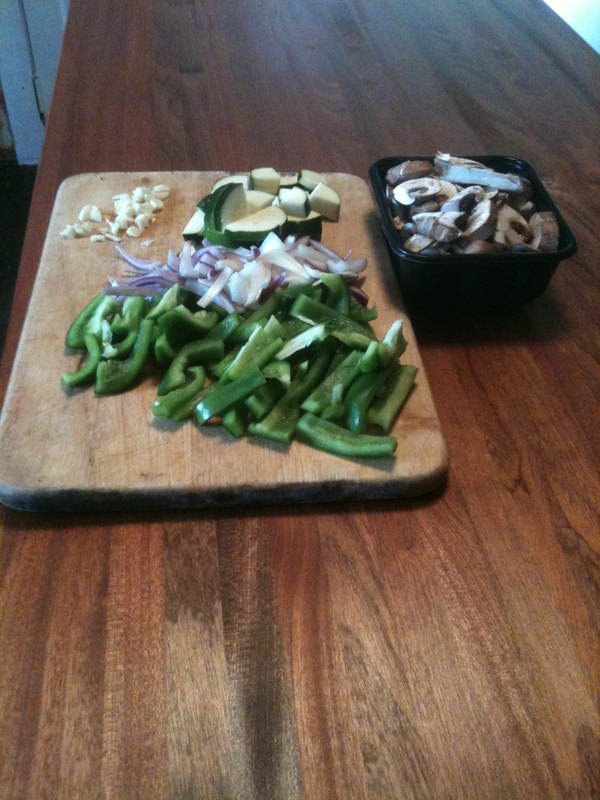 For our first veggie chopping event, we chopped on an old cutting board we’d had for years! But I believe in using what I have; maybe I should just gouge it with a knife and get it over with! That’s the best part about wood though–not only does it make everything more beautiful, it can be sanded, oiled, and made to look beautiful again! I love that wood smell!! I can’t believe how much of a difference the mineral oil makes! I know! And it’s so cheap! We were astonished, and we even expected it because they had sent us a sample block.